Oriental Daily PBAPP TARGETS AT 100% TECHNICAL PERSONNEL COMPETENCY. Sin Chew Daily PENANG WATER SERVICES ACADEMY PROVIDES GOVERNMENT-RECOGNISED TRAINING. China Press PENANG SEEKS TO IMPLEMENT SPRWTS. 6 REASONS WHY SUNGAI PERAK IS THE BEST OPTION. Kwong Wah Jit Poh PENANG MOVING TOWARDS 2050 WITH BENEFITS. WITH THE SUNGAI PERAK WATER TRANSFER SCHEME. 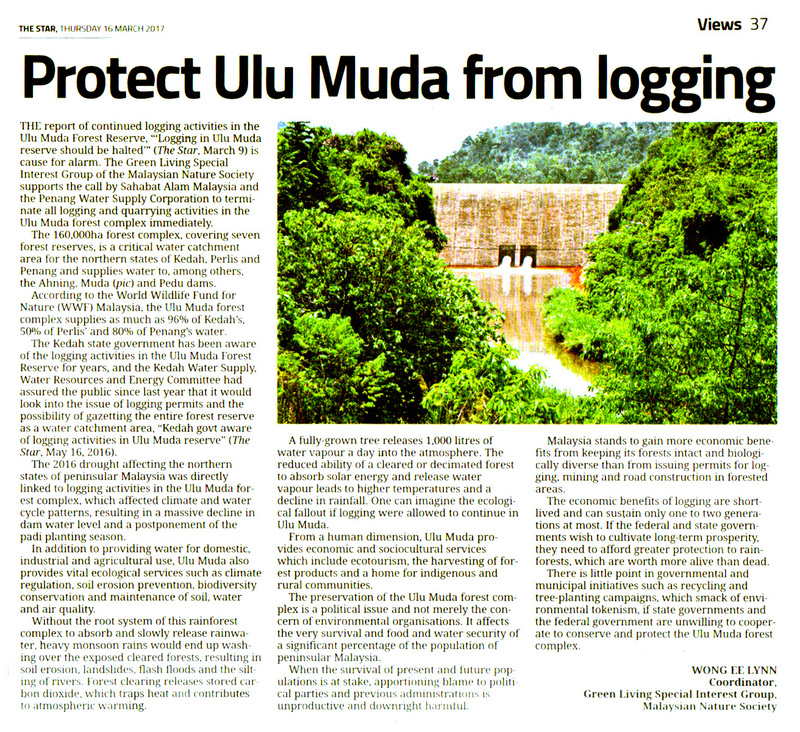 Nanyang Siang Pau ENSURING WATER SECURITY UNTIL 2050. PENANG SEEKS TO IMPLEMENT SPRWTS. Sin Chew Daily PBAPP PLANS TO IMPLEMENT SPRWTS. China Press THERE IS A WATER SUPPLY MASTERPLAN FOR PENANG. JASENI REFUTES WEBSITE’S 4 ALLEGATIONS. China Press WATER PIPELINE PROJECT AT MACALLUM SEAFRONT AREA. NOT SAND MINING. Guang Ming Daily SUBMARINE PIPELINE PROJECT AT MACALLUM. PBA CLARIFIED THAT IT IS NOT SAND MINING. Guang Ming Daily ALIRAN CLAIMED THAT PENANG NEEDS PWMP MORE THAN PTMP. JASENI: THE 4 ALLEGATIONS ARE MISLEADING. Kwong Wah Jit Poh REFUTING ALIRAN WEBSITE’S ARTICLE. JASENI: PENANG HAS POTABLE WATER SUPPLY MASTERPLAN. Kwong Wah Jit Poh PENANG SUBMARINE WATER PIEPELINE PROJECT AT MACALLUM. 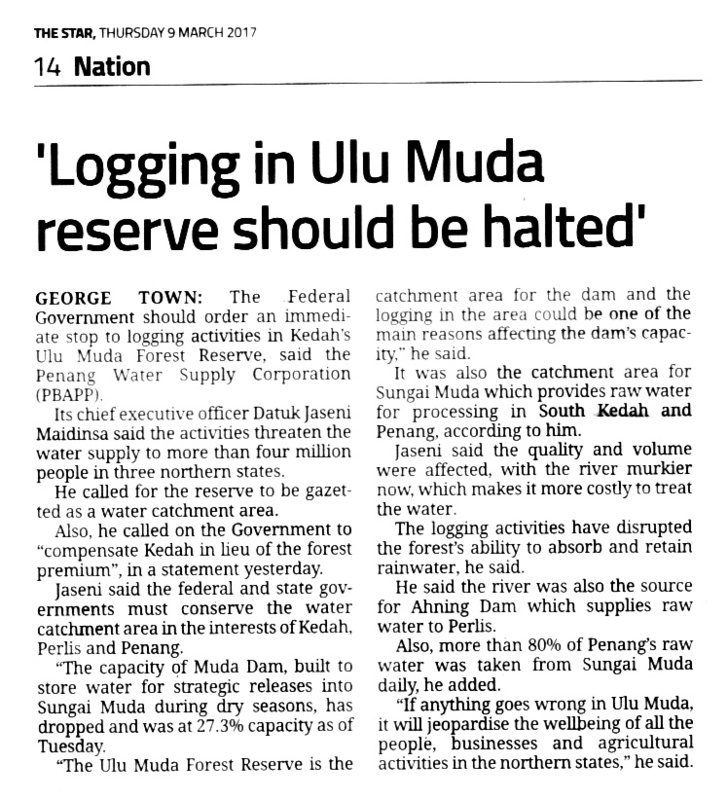 JASENI REFUTES 2 MALAY NEWSPAPERS FOR THEIR CLAIMS OF SAND MINING. Nanyang Siang Pau BUILDING 3RD PENANG SUBMARINE PIPELINE PROJECT. NOT SAND MINING AT MACALLUM SEAFRONT AREA. Oriental Daily THE LAND RECLAMATION AT MACALLUM IS NOT SAND MINING PROJECT. Sin Chew Daily PROJECT AT MACALLUM SEAFRONT IS NOT SAND MINING. PBAPP:THIS IS FOR INSTALLATION OF SUBMARINE PIPELINE. China Press HALF OF THE WATER IN AIR ITAM DAM HAS DRIED UP. WATER SUPPLY DURATION ONLY LEFT 48 DAYS. China Press PUMPING WATER FROM OTHER PLACES AND CLOUD SEEDING. PBAPP TAKES 3 CONTINGENCY MEASURES. China Press REPAIR THE LEFT ABUTMENT OF AIR ITAM DAM WHEN THE DAM LEVEL IS LOW. Guang Ming Daily DRY WEATHER CONTINUES WITH HIGH CONSUMPTION OF WATER AND DROP IN WATER LEVEL AT DAM. PENANG WILL RESORT TO CLOUD SEEDING. Guang Ming Daily CHOW KON YEOW : COVERING NORTHERN MALAYSIA. CLOUD SEEDING REQUIRES COORDINATION WITH KEDAH GOVERNMENT. Kwong Wah Jit Poh CHOW KON YEOW: IF THE VOLUME OF USAGE REMAINS AND NO RAIN FALL. WATER IN AIR ITAM DAM CAN ONLY LAST FOR ANOTHER 48 DAYS. Nanyang Siang Pau THE WATER STORAGE CAPACITY DROPPED 43.1% IN 81 DAYS. AIR ITAM DAM WOULD DRY UP IN 84 DAYS IF THE DRY SPELL CONTINUES. Nanyang Siang Pau WATER EROSION MIGHT AFFECT WATER QUALITY. 1.6MILLION TO REPAIR AIR ITAM DAM. Oriental Daily HIGH WATER CONSUMPTION IN AIR ITAM DAM. ONLY ENOUGH WATER FOR 48 DAYS. Sin Chew Daily AIR ITAM DAM STORAGE CAPACITY CAN ONLY LAST FOR 48 DAYS. The Star Counter measures to take effect if dry weather persists. The Star – Metro North Cloud seeding on the horizon. China Press AIR ITAM DAM STORAGE TO LAST 59 DAYS, PBAPP IMPLEMENTING DRY WEATHER CONTROL MEASURES. Guang Ming Daily TO AVOID WATER SHORTAGE. PBA URGE TO USE WATER WISELY. Kwong Wah Jit Poh PBAPP STARTS CONTINGENCY PLAN. PEOPLE URGED TO CONSERVE WATER USAGE. Sin Chew Daily PBAPP IMPLEMENTS DRY WEATHER CONTROL MEASURES TO AVOID WATER RATIONING. China Press Air Itam Dam 17% More To Reach the Warning Level. Everyone Has To Save Water! Guang Ming Daily Water Level Dropped in Penang’s Dam. PBAPP Urge Public To Conserve Water. Kwong Wah Jit Poh Water Level in Air Itam Dam Has Dropped 24.9%. Public Urged To Conserve Water. Nanyang Siang Pau Air Itam Dam Water Level Dropped 25%. PBAPP Advise Consumers To Save Water. Oriental Daily Hot and Dry Weather Causing Penang’s Dam Water Level Dropped by 24%. Sin Chew Daily The Water Level in Air Itam Dam Has Dropped. PBAPP Urge Public To Save Water. The Sun Water tariff review needed for future of Penang. Star Metro Vital reason for water hike. Star Metro Water hike won’t be taxing. China Press Jaseni : Even if Penang’s water tariff increase is approved, it would not burden the people. Guang Ming Daily PENANG WATER TARIFF REVIEW. WILL NOT OVERBURDEN THE PEOPLE. Kwong Wah Jit Poh JASENI : PROPOSAL TO REVIEW PENANG WATER TARIFF. LOWER INCOME GROUP AND HOUSES OF WORSHIP WILL NOT BE ADVERSELY AFFECTED. Nanyang Siang Pau Jaseni: the water tariff review would not burden the people. Oriental Daily Penang adjusts water tariff, lower income groups continue to enjoy rebates. Sin Chew Daily Jaseni: the water tariff review would not affect benefits for lower income. Sinar Harian Online Banyak negeri setuju naik tarif air? China Press Domestic water tariff and WCS not the same. Water Conservation Surcharge (WCS) was to reduce water consumption. Guang Ming Daily CHIEF MINISTER: PAKATAN RULED FOR 10 YEARS. DOMESTIC WATER TARIFF REVIEWED FOR THE SECOND TIME. Kwong Wah Jit Poh CHOW KON YEOW : PRIOR TO THIS WERE WCS REVIEWS. PENANG WATER TARIFFS REVIEWED ONLY ONCE AFTER MANY YEARS. Nanyang Siang Pau Jaseni：Adopted water conservation surcharge. Penang water tariff increased once in 10 years. Oriental Daily Twice was about surcharges. Penang water tariff only increased once. Sin Chew Daily Chow Kon Yeow: Domestic water tariff rate was only reviewed once since 2008. China Press Water subsidy higher than net profit. Jaseni : It is unreasonable and needs to be reduced. Kwong Wah Jit Poh PBAPP : RM30 – RM40 MILLION PROFIT FOR LAST YEAR. DOMESTIC WATER SUBSIDIES TO BE REDUCED. Nanyang Siang Pau PBAPP submitted water tariff review. Plan to reduce domestic water subsidies by 20%. Oriental Daily Penang will revise water subsidies. Reduce 20% to 30% every three years. Sin Chew Daily CM：Penang’s water tariff review proposal. Reduce domestic water subsidies. China Press RM500 million for water supply projects. That’s why have to increase water tariffs to raise sufficient funding. Kwong Wah Jit Poh PBAPP needs RM500 million to implement 5 projects. Revenue from the water tariff review will be put in as funds. Nanyang Siang Pau In order to get more funds. Penang raises water tariffs to fund water supply projects, says Chow Kon Yew. Oriental Daily Need RM500 million to implement projects. Water tariff increase waiting for approval. Sin Chew Daily PBAPP to avoid water rationing. RM500 million to implement Penang water supply projects. Mandarin News HOT & DRY WEATHER ALERT: PLEASE USE WATER WISELY IN PENANG, IMMEDIATELY.